The personal health record (PHR) is the extension of healthcare management into the home – and will quickly be considered a necessary element of a provider’s offering. Unfortunately, many providers have found it difficult to connect with PHR platforms and consumers are forced to choose among a confusing array of options that may not have the features they need. SPINNphr—The Secure Personal Information & Notification Network fills this gap. SPINNphr allows you to offer a configurable and branded PHR without the cost and complexity of customization of your existing systems. SPINNphr allows you to offer connectivity with the major PHR platforms and a variety of chronic care management devices. SPINNphr fills the information gap between you and your patient. You can give your patients access to features that work for you and for them. To learn more about how SPINN can help your organization, please contact us. White Pine Systems, LLC, offers a unique solution that meets the emerging need for improved communication between health care providers and their patients and families. This goes to the core of President Obama's health information technology funding initiatives. 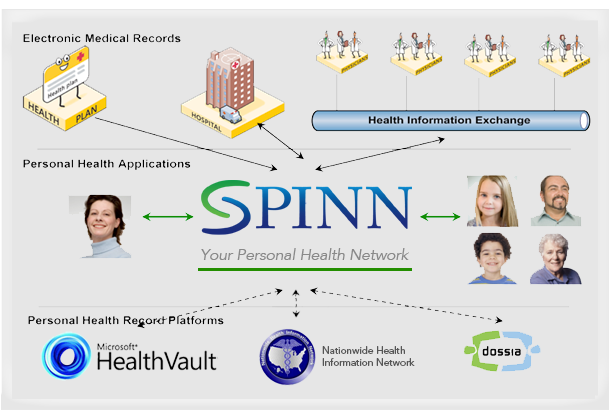 We have combined SPINNphr (www.SPINNphr.com), our interoperable Personal Health Record system built on the Microsoft HealthVault, with AviTracks (www.avicenna-medical.com), an established clinical decision support tool developed at the University of Michigan Hospital, to create an integrated outpatient communication system to improve outcomes and reduce cost. If you already have an installed chronic disease management clinical support tool, we can link to it instead.